Trends are considered “bad words” by some people who love their personal style; they decree proudly that they would never change it for a fad. On the other hand, you have people who do want to dress trendily, and don’t know how to do it. Whether you fall into either category, this post will serve you well. Gingham: You can see how the checks are small, and very familiar- this pattern is predominant in home furnishing as well. Tartan: Where two/more colours crisscross only vertically/horizontally to create the illusion of another colour. Checked: Regular chess board pattern, does not have the softness of gingham. Plaid: Very similar to tartan, two/more colours crisscrossed in different directions. Now that we’ve got that out of the way, let’s move on to the trend. 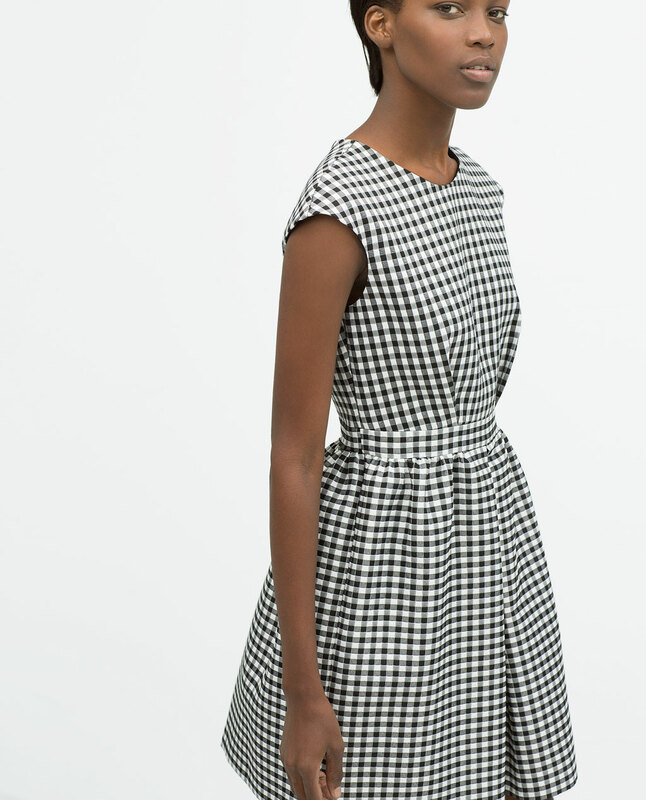 Gingham is a very (dare I say it) cute pattern, and versatile too. It looks fun and playful on all items of clothing. Another reason? It’s a super flattering print for guys to wear. 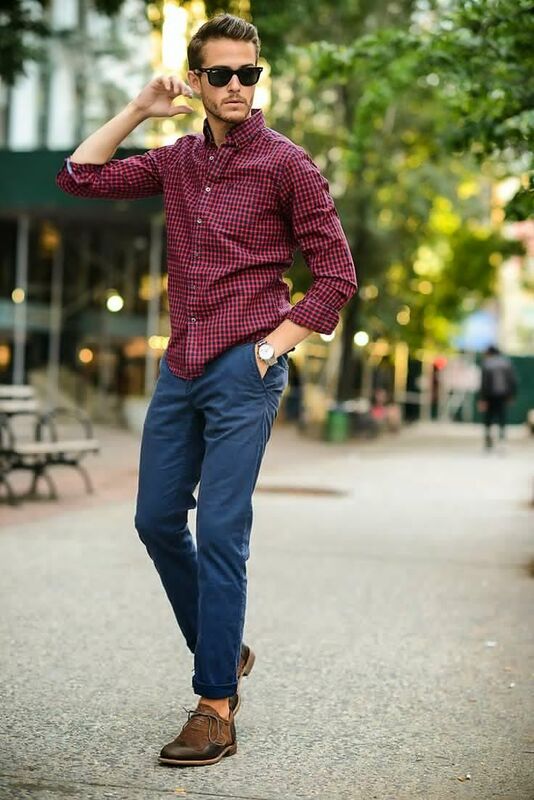 Gingham has grown from being a trend for males to a closet staple– a gingham shirt is now on the list of essentials for guys to own. Proof’s in the pudding– it pairs beautifully with blazers, and chinos alike. Plus, it’s a great way for guys new to print to experiment. Swap it out with your regular dress shirt and wear it with your blazer. Want to pull off pink? Try it out in a gingham first, for a fresher take on the colour. So next time you’re out to shop, look for this print on your shirts. I would suggest Marks & Spencer for success. IT ALSO LOOKS GOOD WITH SHORTS GUYS. Isn’t that enough? Scroll for inspiration! White shirt who? Gingham is the way to go. Gingham + tan? YES! Chinos would work instead of a blazer. Love this last one- a black gingham looks really classy with denim. Images via Pinterest. And now, for the girls. I think gingham has a more “spring” feel to it than a regular check or plaid (the latter always reminds me of winter). I think it’s because gingham is predominantly white, and that makes it a fresh pattern. It’s cute without being cutesy-only-for-kids-below-5. Whether it’s on pants, skirts, or shirts, gingham manages to lend a preppy feel to the outfit, and also instantly makes you more dressed up with zero effort. You don’t have to accessorise with a necklace either. Just a gingham shirt, trousers & nice flats, paired with a watch and a few bracelets + ponytail = easy summer chic. If you have the money for these shoes, by all means, buy them. They’re super cute! 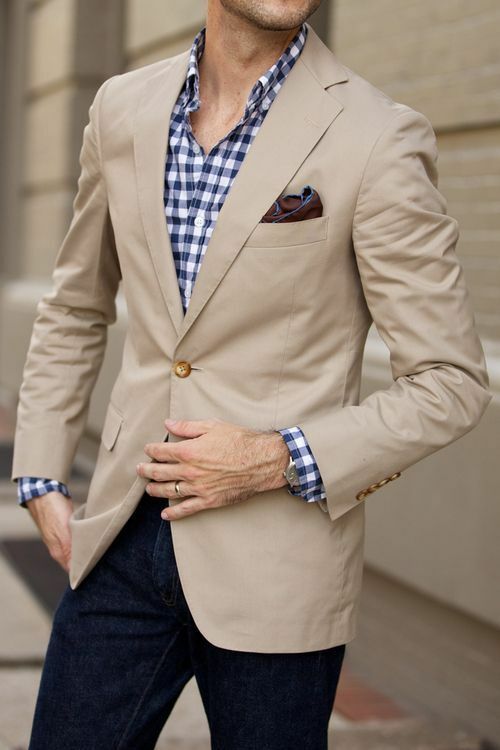 Navy gingham & tan are a match made in heaven. I love how chic this pairing is, and the larger size of the pattern too. Such a simple way to wear this print, yet so eye-catching! Love the pop of red with the bag. 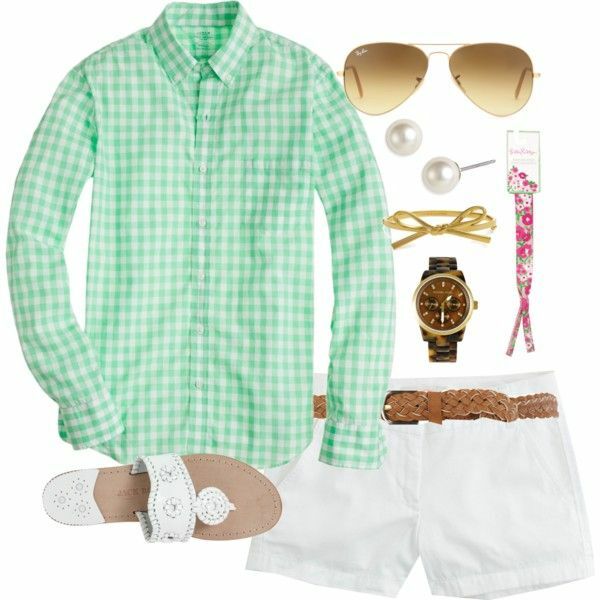 This breezy green gingham + shorts combination proves that this trend is meant for the summer. 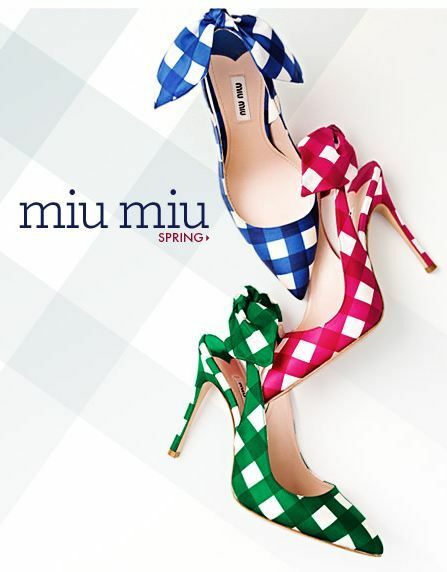 My gingham picks for girls? This Forever 21 shirt. Wear it with white jeans, light blue flats, and a messy braid. This Zara dress screams preppy without being attention-seeking. Wear with a bright red lip, black heels, and wayfarers. Hope you liked this trend recap! How will you wear gingham?